Microsoft Office 2019 is the current version of Microsoft Office, a productivity suite, succeeding Office 2016. It was released to general availability for Windows 10 and for macOS on September 24, 2018. Some features that had previously been restricted to Office 365 subscribers are available in this release. 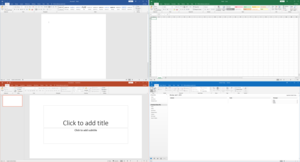 On April 27, 2018, Microsoft released Office 2019 Commercial Preview for Windows 10. On June 12, 2018, Microsoft released a preview for macOS. Office 2019 includes many of the features previously published via Office 365, along with improved inking features, new animation features in PowerPoint including the morph and zoom features, and new formulas and charts in Excel for data analysis. OneNote is absent from the suite as the UWP version of OneNote bundled with Windows 10 replaces it. OneNote 2016 can be installed as an optional feature on the Office Installer. For Mac users, Focus Mode will be brought to Word, 2D maps will be brought to Excel and new Morph transitions, SVG support and 4K video exports will be coming to PowerPoint, among other features. Despite being released in the same month, the new Office user interface (including their new icons) in Word, Excel, PowerPoint, and Outlook is only available to Office 365 subscribers, not perpetual Office 2019 licensees. The Office 2019 user interface retains the Metro design language from Office 2016, except that the Microsoft account picture is circular. Office 2019 requires Windows 10, Windows Server 2019 or macOS Sierra and later. macOS installations can be acquired from the Microsoft website or the Mac App Store. For Office 2013 and 2016, various editions containing the client apps were available in both Click-To-Run (inspired by Microsoft App-V) and traditional Windows Installer setup formats. For Office 2019, the client apps only have a Click-to-Run installer and only the server apps have the traditional MSI installer. The Click-To-Run version has a smaller footprint; in case of Microsoft Office 2019 Pro Plus, the product requires 10 GB less than the MSI version of Office 2016 Pro Plus. Office 2019 will receive five years of mainstream support, but unlike Office 2016 which gets five years of extended support, Office 2019 only gets two. Mainstream support ends on October 10, 2023, while extended support ends on October 14, 2025. ^ a b "Office 2019 is now available for Windows and Mac". Microsoft 365 Blog. Microsoft. 24 September 2018. ^ a b "Update history for Office 2019". Microsoft Docs. Retrieved 10 April 2019. ^ "Update history for Office for Mac". Microsoft Docs. Retrieved 19 April 2019. ^ "System requirements for Microsoft Office". Office.com. Microsoft. Retrieved 24 September 2018. ^ "Language Accessory Pack for Office 2016". Office.com. Microsoft. Retrieved 25 February 2016. ^ Warren, Tom (26 September 2017). "Microsoft is releasing Office 2019 next year". The Verge. Vox Media. ^ Warren, Tom (27 April 2018). "Microsoft releases Office 2019 preview". The Verge. Vox Media. ^ Warren, Tom (12 June 2018). "Microsoft releases Office 2019 for Mac preview". The Verge. Vox Media. ^ Devereux, William (18 April 2018). "The best version of OneNote on Windows". Microsoft Office 365 Blog. Microsoft. Retrieved 19 April 2018. ^ Warren, Tom (18 April 2018). "Microsoft Office 2019 kills off OneNote desktop app in favor of Windows 10 version". The Verge. Microsoft. ^ "Frequently Asked Questions about OneNote in Office 2019". Office.com. Microsoft. Retrieved 1 August 2018. ^ a b Caldas, Bernardo; Spataro, Jared (1 February 2018). "Changes to Office and Windows servicing and support". Windows IT Pro Blog. Microsoft. Retrieved 29 August 2018. ^ Warren, Tom (24 January 2019). "Microsoft Office now available on Apple's Mac App Store". The Verge. Retrieved 1 February 2019. ^ "Office 2019 perpetual volume license products available as Click-to-Run". Support. Microsoft. 27 April 2018. This page was last edited on 31 March 2019, at 20:49 (UTC).